Philip Blumel: I’m floored. I don’t know what to say. Global warming or not, it appears that hell has frozen over, and one of that region’s chief minions has come over to the light. Philip Blumel: Hi. I’m Philip Blumel. 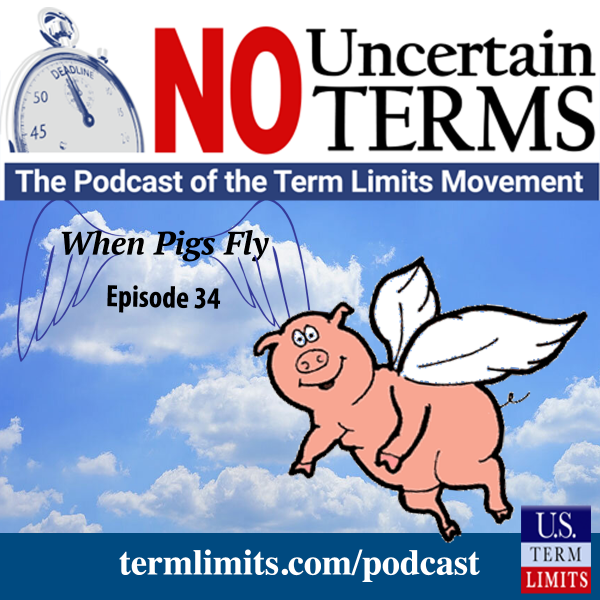 Welcome to No Uncertain Terms, the official podcast of the term limits movement for the week of April 1st, 2019. Philip Blumel: Let’s start with the big news and then let’s turn to U.S. Term Limits executive director Nick Tomboulides to make some sense of it. Speaker 2: This is CNN breaking news. Speaker 3: In a surprise about face on Friday, Senate president Mitch McConnell came out in support of an amendment to impose term limits on the U.S. Congress. McConnell told reports that he had signed a popular pledge that commits him to co-sponsor and vote for the U.S. term limits amendment limiting all senators to 12 years in office and how members to six. Speaker 3: In 2016 McConnell said the term limits amendment would never get a hearing as long as he was the senate leader. The senator has not reconsidered in light of the growing number of co-sponsors in the House and Senate and states calling for an amendment proposing convention to bypass Congress if it does not act on the measure. Speaker 2: This is CNN. Philip Blumel: Well, Nick, I just don’t know what to say about that. Mitch McConnell. Nick Tomboulides: Mitch McConnell. It’s pretty amazing. One small step for a man, one giant leap for a turtle. Philip Blumel: Well, I don’t think we can call him a turtle anymore. He’s a pledge signer. He’s on our side. He joined the forces of good and light. Nick Tomboulides: In truth he’s a turtle who’s very young at heart on this occasion. Philip Blumel: There you go. There you go. Nick Tomboulides: It’s a pretty momentous deal. He was first elected in 1984, so that, along with his voting record, probably would make George Orwell pretty proud. But it’s not every day you see six term Senator agreeing to term limits, but it’s happening. Nick Tomboulides: He called us up and he said, “Look, I know I’ve obstructed the American people for 30 years. My bad. I want to make things right, so how do we do term limits?” We sent him the USTL Pledge, and the rest was history. Nick Tomboulides: So, April 1st will finally be remembered as the day Mitch McConnell came out of his shell and he finally listened to the voters. Philip Blumel: All right. That sets us off for a great week of term limits activism. Another great thing has happened too. You were, once again, in the capitol of Florida, Tallahassee, where the bill to impose eight year term limits on all the school boards in the state has crossed another threshold. Philip Blumel: When anti-term limits politicians see they’re losing the battle their favorite fall back is to pretend that they support term limits, but that the proper term is 12 years or 16 years or 100 years. Philip Blumel: In front of a Senate subcommittee two weeks ago, our own Nick Tomboulides reminded Florida legislators what happened back in 2006 when state politicians tried to stretch their own time in office past eight years. Nick Tomboulides: I want to take you all back in history to the year 2005. Do you remember where you were back then? George W. Bush was president, Kanye had just released, “Gold Digger.” Back then I was just a nerd in high school cramming for exams and hoping my prom date didn’t get cold feet. Nick Tomboulides: The founder of the group, business man from Treasure Island, was quoted as saying, “Those who don’t remember the voters, will get a vivid reminder in the skies.” It was a movement unlike any other driven by passion and energy. And the legislators knew it. That’s why in 2006 the State Legislature did something unprecedented. Feeling the heat, they voted to revoke the 12-year term limits amendment from the ballot before it could even be voted on. Nick Tomboulides: So the public backlash against 12 years in Florida was that intense. It’s a cautionary tale, and what has changed since? Absolutely nothing. The people of Florida are more on fire for eight year term limits than every before, and they also have a strong distaste for 12 year term limits. According to a new poll by Polls Research, 77% of Florida voters back the Constitutional amendment limiting all the school boards. In that same poll, 84% said that the limit should be eight years versus just 10% who said that it should be 12. Nick Tomboulides: The voters passed eight year term limits on the legislature in 1992 with 77% of the vote. Whenever voters anywhere in this state initiate a term limits law, they do it for eight years. They fought tooth and nail against the 12 year limit in 2005, and they will not tolerate a 12 year limit for school boards. Nick Tomboulides: So my message is very simple. Eight is great and it’s time to shelve 12. Thank you. Nick Tomboulides: Critics of school board term limits often tell me, “We don’t need them. It’s not like anybody is staying too long.” Well, that’s fake news. I just found the longest serving school board member in the State of Florida. His name is Keith Hudson from Columbia County. Hudson was first elected in 1976, and he has been in office for 43 years. When I popped out of my mama’s womb in 1989, this guy had already been in office for 13 years. Think about that. With the pace of innovation and teaching and technology, could you imagine entrusting your child’s future to someone who took office during Gerald Ford’s administration? Could you imagine after four decades how entrenched and powerful an incumbent becomes? Nick Tomboulides: And he’s not the only one. There are swamp creatures like Hudson all over the State of Florida, all over America, in fact. Many run unopposed. Nearly all run under opposed, and they have a re-election rate around 90%. Eight year school board term limits is not a solution in search of a problem, it is a time tested check on power and one all school boards desperately need. Nick Tomboulides: So thank you to everyone who has been involved so far in Florida in this amazing campaign. We’re building momentum and we’re getting closer each day. And by the end of this we’ll be able to say we did something really special to give government back to the people. Nick Tomboulides: So it got through the House Education Committee Thursday on a bipartisan vote, 14 to three vote. It’s making headlines and waves all around Florida. People are realizing you’re going to get accountability, you’re going to get common sense finally coming to these school boards. Philip Blumel: Very well put. Nick Tomboulides: Yeah, it was very well put. And I think that was really the clincher. It was a very passionate little speech he gave. It was the clincher to bring some votes over to our side and win with a decisive margin. Nick Tomboulides: Of all the legislation moving in Florida this session, I don’t think there’s really anything moving faster than school board term limits. This is very, very hot, and it feels like there’s an impetus to get it done. Philip Blumel: Jerry Sonnenberg is a member of the Colorado Senate, representing District Number 1. Colorado is one of the 15 state legislatures with term limits and Sonnenberg would like to see that policy extended to Washington D.C. He spoke up during the debates over the Term Limits Convention Resolution last year. Sen. Sonnenberg: Thank you, Mr. Chair. I would much rather be a part of this government here in the State with term limits and how this works as compared to Washington D.C. and the current power, the lobbyist and the bureaucrats have in Washington D.C.
Sen. Sonnenberg: To me, it is the height of arrogance to assume that I am the greatest Senator to ever serve my district and should never, ever be thrown out of office. It’s the height of arrogance to think that there’s nobody else in my district that can represent that district in a citizens’ legislature. I’m offended at career politicians. I’m offended that those politicians that do nothing but stay in Congress for 40 or 50 years. And I agree with you. We need term limits. We need people with new ideas to straighten out that cesspool of sharks in Washington D.C. that have ruined our country. Nick Tomboulides: Also in the news this week of interest to term limit activist was a presidential candidate was asked on the stump while campaigning what she thought of term limits. And Elizabeth Warren, Senator from Massachusetts, came out against Congressional term limits. Elizabeth Warren: Here’s the problem on term limits on folks in Congress. It makes them more dependent than ever on the lobbyist. Believe me, if the Senators only stay for two terms, the lobbyist will be there a lot longer, and they’ll know how the game is played. And they know how it’s played big time. And that’s the part that keeps me worried. Nick Tomboulides: Well, first mad props to Ken Quinn, the northeast regional director of U.S. term limits. He was the guy that went to this town hall in Conway, New Hampshire, and actually won the lottery to ask Elizabeth Warren the question. Isn’t that funny, we call ourselves a democracy, but if you want to actually get access to a politician and ask them a question you need to win the lottery. Philip Blumel: Oh, good Lord. Oh, we’ve heard that connard before. Nick Tomboulides: How many times have we heard that before? Philip Blumel: Oh, a zillion times. Nick Tomboulides: And how do you usually respond when you hear that? I mean, I know how I respond, but I want to hear your take. Philip Blumel: Yeah, what I usually say is that, “You know, that sounds plausible if you don’t know how the system really works. But you know who disagrees with you? Lobbyist. They are dead set against term limits. They oppose us at every turn. And the reason why is because it limits their influence and control over politicians and it severs the relationships that are the stock and trade of being a lobbyist.” Lobbyists hate term limits. It does not give them more power. It takes it away. Nick Tomboulides: And you would think a self-described reformer like Warren should know that, right? Philip Blumel: Well, I think she does know that. Coming out against term limits, I think, really takes away from her reformist credentials, and certainly in my eyes it really makes me feel like she’s not serious about reforming Congress if she’s not going to embrace the chief, number one and simplest reform that’s necessary. Nick Tomboulides: Yeah, no. I couldn’t agree more. She’s got this reputation she’s tried to cultivate as the person who is charging into Washington very head strong, taking on the status quo. But finding out she opposes term limits really sort of takes away that image, in my opinion. Nick Tomboulides: So, it really is bunk and it’s alarming to hear someone of Elizabeth Warren’s stature repeating those kind of talking points. You made another interesting point too. She said that because she was an incumbent when she ran for re-election to the Senate, she didn’t have to run any radio or T.V. ads during her campaign. And she said this was a good thing because she could instead spend that money to employ these younger staffers and get them involved. Nick Tomboulides: Here’s my question, if you had term limits, wouldn’t a lot of those young and creative people actually be able to run for office and serve in Congress instead of having to pay their dues as flax on her campaign? Nick Tomboulides: The message these incumbents are sending to young people is, “We want you to be close enough to the political process to help us win, but don’t you ever get too close and take our jobs.” That’s self-serving. That’s not sacrificial. Scott Tillman: Hi. This is Scott Tillman, the national field director with U.S. Term Limits. I want to let you know about some upcoming events where you can connect with us to discuss term limits. Our executive director, Nick Tomboulides, will be attending the Unrig Summit in Nashville, Tennessee. This is hosted by the Represent.U.S. Group and there will be many groups there presenting and discussing election reforms and improvements our current system needs. Scott Tillman: We will also be at Freedom Fest July 17th through 20th in Las Vegas, Nevada, at Netroots July 11th through 13th in Philadelphia, Pennsylvania and at Western Conservative Summit July 11th through 13th in Denver, Colorado. Scott Tillman: There are many events happening around the country. If you know of an event where U.S. Term Limits should be, please contact us with the details. Philip Blumel: Okay. Down in North Carolina we have a special election coming up to fill the seat of Mark Harris, whose election was voided because of shenanigans. So there’s going to be a new election, and it’s the Republican district, so there’s a long list of Republicans running for the seat as well as a Democrat, a Libertarian and a Green Party candidate. So it’s a very crowded field. Philip Blumel: And it turns out that three of that field so far have signed the U.S. Term Limits Pledge that if they are elected they will co-sponsor and vote for the U.S. Term Limits amendment that is introduced in the House. Philip Blumel: And I point out that Matt Riddenower went so far as to create a YouTube video on the subject of term limits. Role it. Matt Riddenower: Career politicians put their interests before the interests of America. They become less concerned with doing what’s right and more concerned with maintaining a strangle hold on their office. We’ve witnessed this time and time again with long term incumbents. Elected officials who seek to remain in their office indefinitely, will break promises. They will bend the special interests, and they will compromise against the will of their constituents if it’s profitable. This has to stop. Matt Riddenower: I will support legislation for term limits. We can restore dignity to representation by removing corrupting incentives. Men and women should be in Washington D.C. as a service to their communities not for personal gain. Nick Tomboulides: It’s a great video, and there are 13 candidates running in this race. It’s a teachable moment because you’re seeing the power of an open seat Congressional election. Sometimes we don’t even describe term limits as term limits. We call it open seat Congressional elections, to emphasize what the real objective is here. It’s to stimulate competition for these elected offices. Nick Tomboulides: When a seat is open, it’s not uncommon to see a dozen or more candidates vying for it like you’re seeing here. And they all have an incentive to produce policies that are very close to what the average voter wants. Nick Tomboulides: When an incumbent holds a seat, it couldn’t be more different. It’s one candidate running most of the time. It’s two if you’re lucky. If you’ve got one person challenging an incumbent who’s a serious contender, you’re actually lucky, because the vast majority of the races are either unopposed or under opposed. So it’s great to see the benefit of open seat elections here laid bare in North Carolina. Philip Blumel: It’s real democracy happening right there. Philip Blumel: Happy April Fools Day. We would love to see arch term limits foe, Mitch McConnell, sign the U.S. Term Limits Pledge. But I’m afraid, as of now, that’s a news report you’re likely to hear only on April 1st. Philip Blumel: Oh, but times they are changing, and you can help. If you live in Arizona, Florida or Georgia be sure to go to Termlimits.com and under the current, “Actions,” tab, contact the key legislators in your state. All the info you need will be right there. It will take you two minutes. Philip Blumel: You might have noticed the No Uncertain Terms podcast has a new mobile friendly interface so you can more easily find and play this show from your phone, or better, subscribe to the No Uncertain Terms podcast. You can use the podcast app on your iPhone or Stitcher or Google Play on your Android device. Philip Blumel: We’ll be back next week. Stacey Selleck: The Revolution isn’t being televised. Fortunately, you have the No Uncertain Terms podcast. Speaker 3: The vote may have been a reprisal for the last week’s unexpected vote in the U.S. Senate on the so-called Green New Deal, in which not a single Senator voted yeah, not even the resolution sponsors. What? Is that real?